Happy Stemsrud was born and raised in Charlotte, North Carolina. After earning her B.A. in Early Childhood Education from Mount Vernon College in Washington DC, she moved to Colorado. In 1998, Happy graduated from the Pilates Center of Boulder with her Pilates teacher’s certification. This program is considered the most respected, comprehensive and intensive Pilates curriculum of its kind in the world. This program was developed with the assistance of Romana Kryzanowska, heir to the classical method of Joseph Pilates. The curriculum has been labeled, “The Harvard of Pilates Teacher Training Programs. Comprised of almost 900 hours, it is considered to be the most rigorous teacher training program available. Happy is a graduate of The Pilates Center Master’s Program. After moving to Steamboat Springs, Happy has been in private practice as a Pilates instructor for over fifteen years. Over the past decade, she has taught numerous weekly private sessions with and without equipment. She likewise conducts several weekly mat sessions from beginner through advanced. Happy finds she is most rewarded by teaching “classical” Pilates. She enjoys presenting detailed evaluation of all movements with regards to all aspects of the discipline. 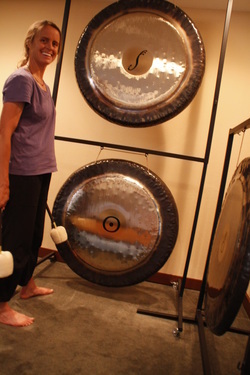 In addition to a thriving Pilates studio, Happy now practices energy work with tuning fork therapy and gong therapy. In 2010 she was introduced to sound therapy through Accutonics. In 2011 she studied with Sylvia Pelcz-Larson at the Aquarian San Greal School. In 2012 she finished her training and is now a practitioner of tuning fork sound therapy. Her approach to tuning fork therapy is through the Chinese medicine model of acupressure. She uses the forks to access the body's meridian systems and Chakra energy systems.Through acupressure points the sound waves vibrate and send their vibrations deeply into the body through these energy systems. Tuning fork energy work is a deeply relaxing and balancing experience for the body. In 2013 Happy is now enrolled at the Upledger Instatute for certification in Cranial Sacral Therapy and Somato Emotional Release Therapy.